The top three winners were invited to the Fuddruckers Convention in Las Vegas. 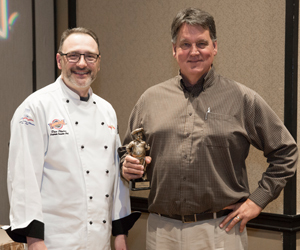 At the convention, Fuddruckers’ Corporate Chef made each burger while closely adhering to the recipe, toppings and ingredients submitted by the winners. Convention participants voted for each of the three burgers by placing a poker chip indicating their first, second and third choices. Timmons’ sriracha pimento cheese and bacon burger came in first place, before the French onion dip with potato chips burger. Timmons’ burger will be on the menu in Fuddruckers stores from June 19 to August 20 for a test run. If successful, it could be adopted into the Fuddruckers menu permanently. Timmons has been with Fuddruckers for 23 years and manages all catering for nine locations and two mobile Fudds trucks across South Carolina, North Carolina and Tennessee.